Notwithstanding concerns over the sliding rupee against the dollar, Finance Secretary R S Gujral said on Friday the depreciation of the Indian currency will ultimately help exporters in the long run. "The depreciation of rupee prima-facie would help exporters in terms of higher realisation in terms of rupee... overall in the long term it would help the exporters," he told reporters after the meeting of board of trade chaired by Commerce and Industry Minister Anand Sharma. Referring to the concerns raised by industry captains and others during the meeting, Gujral admitted that the weakening Rupee is hurting importers. 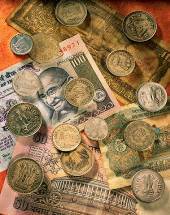 The rupee was trading at 55.92 against the dollar in at the Interbank Foreign Exchange (Forex) Market. Giving details of the BoT, Sharma said "We had a detailed discussion. We looked at all the critical aspects ... (and) critical challenges of the economy". The minister said suggestions made during the meeting would be reflected in the annual Foreign Trade Policy which will be announced on June 5. "Some suggestions of this meeting will be reflected in the annual Foreign Trade Policy," Sharma said. On the $500 billion export target for 2014, Sharma said, "we know it is a challenging target in the wake of deceleration in the western countries and eurozone crisis". Among others who attended the meeting included, Chanda Kochar (MD, ICICI Bank), Y C Deveshwar (Chairman, ITC) and presidents of three leading chambers -- CII, FICCI and ASSOCHAM. Some members of the BoT such as Mahindra and Mahindra Group Vice-Chairman Anand Mahindra, Biocon chief Kiran Mazumdar Shaw, TVS Motors Chairman Venu Srinivasan, Ashok Leyland MD R Seshasayee, Apollo Tyres CMD Onkar S Kanwar and Hero MotoCorp MD Pawan Munjal, could not attend the meeting. The BoT is a top advisory body on external trade to the government. Share your ideas on how the rupee can be saved. See what others have to say. Is Biocon GUILTY of accounting fraud?